There’s a new $0.75/1 Starbucks Ice Cream printable coupon available right now. Use this at Walgreens this week to score Starbucks Ice Cream for just $1.75! Walgreens is HOT this week, so be sure to check out these other Walgreens weekly deals before you shop! Right now you can get a $10 Starbucks gift card for just $5 on Friends and Family Circle! I’m guessing this offer won’t last long, and the site is already very slow, so just keep trying. Update: Sorry, this is sold out now. You should receive your gift card in 5-7 business days, and it’s good at Starbucks locations nationwide. 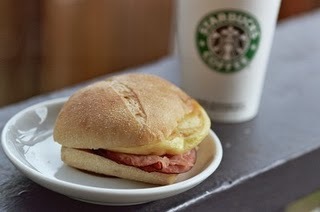 New members of My Starbucks Rewards will receive a FREE Artisan Breakfast Sandwich coupon by mail! Just register any Starbucks gift card with the program. Expires 9/21/10. Don’t forget you can search and win with Swagbucks to earn enough to score a FREE Starbucks gift card. If nothing else, these might be good to have on hand to give to other parents at play dates and such!